The place name ‘Pelham’- its probable meaning ‘place of springs’ - first appears in print in the Domesday Survey of 1096. The name ‘Brent’ – ‘burned’ is either a reference to a great fire in the reign of Henry 1 (1100 – 1135), which destroyed the village, or a confused allusion to the river Ash which has its source nearby. Occupying high ground in the centre of the village stands the church dedicated to St Mary, a common dedication amongst churches in the locality perhaps indicating they were stages on the way to the medieval centre of pilgrimage at Walsingham in Norfolk, the shrine of Our Lady. The first written mention of the church goes back to the reign of King Stephen (1135 – 1154). The then Bishop of London, Richard de Beames, made over jurisdiction of the churches of Brent and Furneux to the Treasurer of St Paul’s and this church was ‘inspected’ by representatives of St Paul’s in 1252. It did not impress the inspectors. It seems to have been a poor sort of place – the steps before the altar were of mud, the church had only five books - all but one in poor condition - and the treasure consisted only of a partly gilded silver chalice, a chrismatory (a container for holy oil) of tin, two old tin candlesticks and a tin pyx (small box). But there was a chaplain and a clerk with lodgings near the graveyard. Some years later, in 1291, the annual value of St Mary’s was £5. A subsequent visit in 1297 found matters worse; the graveyard was ill-enclosed and unclean, the belfry unthatched, the church ill-thatched with straw and with four unconsecrated altars. A painted crucifix in mid nave had been damaged by rain but the book collection had increased to eight. In 1458, the Dean of St Paul’s visited in person. He found the church roofless and a chaplain, who kept his horse in the graveyard, preached discreditable sermons and chatted to the congregation during the service. But there were now two silver chalices and several articles of gilt and brass. What remains of this medieval structure? The present church with its walls of flint rubble and its tiled roof was built in the middle of the 14th Century. The small south door (on the right in front of the altar) has early 14th Century stonework – look at it from the outside – as do both north and south windows in the chancel. On the left in the middle of the nave in a niche in the wall is a 13th Century black marble slab showing a foliated cross. An angel above it bears a soul in the form of a shape in a cloth, and around it symbols of the four evangelists. It is decorated with carvings in the high relief characteristic of the 13th Century and shows a cross issuing from the mouth of a dragon. The memorial verse is a later 18th Century addition and the story that it tells of Piers Shonks, a local dragon-slayer, is probably an illustration of the point of the carving – the triumph of Christianity over sin. The 15th Century saw the construction of the west tower with its diagonal buttresses and Hertfordshire spike and, interestingly in his History of Hertfordshire, John Cussans mentions a chamber in this tower designed as a ‘parvoise’ or cell for an anchorite or recluse but says, in the absence of any remains of a chimney, it is unlikely it was ever inhabited. This century also saw the installation of a rood screen. This was removed in later renovations but some of the carved wooden tracery was used to form a tower screen and can still be seen. Church registers, now lodged for safe keeping in the County Records department, began with baptisms in 1539 and an inventory of 1552 mentions one silver chalice, four vestments and three bells in the belfry. In the floor near the organ is an unusual tablet depicting the two wives of John Rowley – Mary and Ann – looking identical in their Puritan garb of the 1630’s. Two of the bells in the tower date from this century, which are inscribed ‘Miles Graye fecit 1634’ and ‘Miles Graye fecit 1637’. The High Sheriff of Hertfordshire in 1648 – who was a merchant, twice Master of the Mercers’ Company, Alderman and Sheriff of the City of London – Francis Flyer (or Floyer) lived in Brent Pelham Hall with his family. When he died he left an annuity of seven pounds, sixteen shillings through the Mercers’ Company for weekly distribution of bread amongst the poor of Brent Pelham. His great granddaughter, Catherine Floyer, who died single in 1758, has two memorials in the church. The first, a marble tablet behind the organ, tells of her bequest to the poor and needy of the parish. The second, rather grander white marble stone in the wall in mid nave and is dedicated to the memory of her dear relations. It traces the family from the Norman Conquest. The engraving has been recently repainted and the whole inscription is well worth reading, including its telling moral ending. A later Floyer daughter, an only child, married Thomas Halden, whose family memorials are in the nave floor, and the estate passed away from the Floyer name. Thomas Halden died in the year of the French Revolution. In 1792 another bell made by J Briant of Hertford was hung. In the middle of the 19th Century, the chancel roof fell in. It was repaired and the opportunity for some remodelling taken. An organ was installed in the chancel behind the pulpit, a porch built, the chancel screen removed and the roof raised higher. Photographs on the outer vestry wall show the ‘before’ and ‘after’ of this Victorian reordering in 1862. The tower was restored and the bells re-hung by Mr Edward Barclay, whose family had bought Brent Pelham Hall in 1865. Their memorial stones are in the right side walls of the nave. Outside the churchyard gates are the stocks and scold’s seat. St Mary’s was consolidated with the church of Furneux Pelham in 1771 and in 1877 they were finally taken into the diocese of St Albans – up till now they had not been subject to the jurisdiction of local bishops. 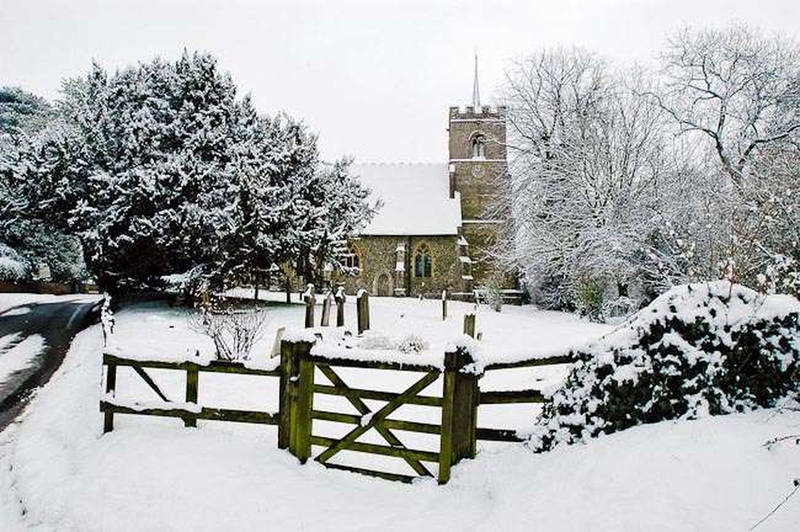 St Mary’s now forms part of the United Benefice of Hormead, Wyddial, Anstey, Brent Pelham and Meesden. At a celebratory village service on 20 May 2012, the Royal Coat of Arms, mounted in the nave, was blessed by the Bishop of St Albans to mark both the 150th anniversary of the reopening of the church after its Victorian reordering and the Diamond Jubilee of HM Queen Elizabeth II.